The Japanese captured most of Burma in early 1942 and the British and Indian troops supported by the Royal Air Force with some American and Chinese assistance, fought for three and a half years to free the country in a campaign that lasted longer than any other British campaign of the Second World War. Australian naval vessels stationed in the India Ocean at times served in Burmese waters, but no Australian units served in the campaign, although many airmen of the RAAF served in RAF squadrons, and in 1945 some Australian Army liaison officers served in Burma. As of May 1943, approximately 330 Australians were in active service in 41 squadrons in India. 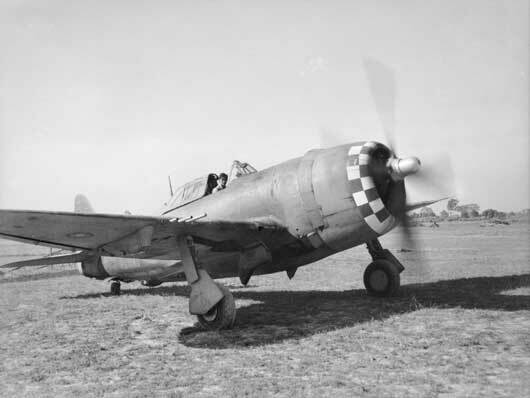 Only 9 of these squadrons had more than 10 Australians serving in them. In 1942, the Burma Corps was forced to retreat to the border of Burma and India. During the 1942-1943 dry season, a small scale offensive into the coastal Arakan region of Burma was unsuccessful. Late in 1943 the Japanese commenced planning an invasion of India. In February 1944, the Japanese counter-attacked the Indian XV Corps in Arakan, using the tactics that had so far been successful for the Japanese; moving around the flanks to surround enemy positions forcing them to surrender and then using the enemy supplies for the next phase of the advance. The cut off British and Indian troops held fast and were resupplied by air in an action known as the Battle of the Admin Box. The Japanese ran out of supplies and were forced to retreat. While the battle emphasized for the allies the importance of air supply, the planning for the Japanese offensive was too far advanced to take account of the lessons of the battle. The Battles of Imphal and Kohima took place between March and June 1944 when the Japanese launched their invasion of India. The British and India troops withstood the Japanese attacks and with air support and air supply went onto the offensive on 1 May. The Japanese finally ordered the offensive to be broken off on 3 July by which time the Japanese had suffered the largest defeat in Japanese history with 55,000 casualties, including 13,500 dead. The battles were the turning point of the Burma campaign. In 1945, the British Indian Army pushed the Japanese out Burma capturing Rangoon in May just before the monsoons broke. RAAF Warrant Officer F.J. Kevin taxies his aircraft of 258 Squadron RAF to a dispersal bay at an advanced airfield in the Arakan, on the Burma front (AWM SEA0046). 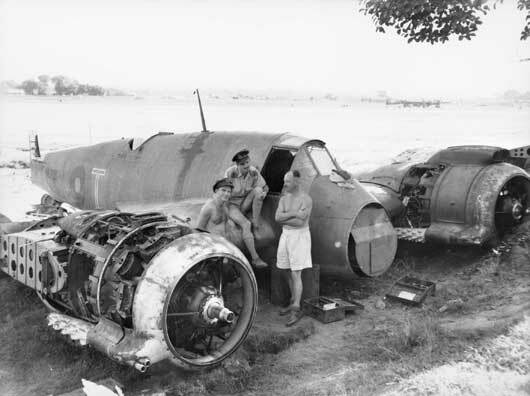 A Beaufighter aircraft being dismantled for overhaul at Arakan, Burma (AWM SEA0052). 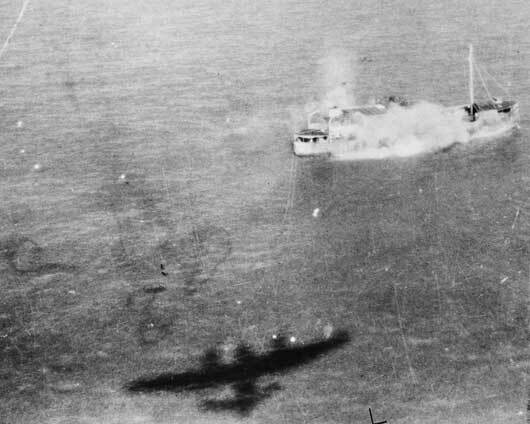 The shadow of an RAF Beaufighter is thrown on the sea as it goes in to attack a Japanese merchant vessel off Elephant Point on the enemy held Burma coast (AWM SUK12576). 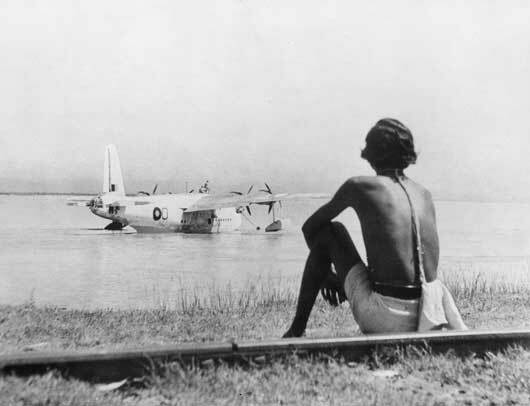 An RAF Sunderland aircraft operating in Burma at its base on the Brahmaputra River (AWM SUK13085). 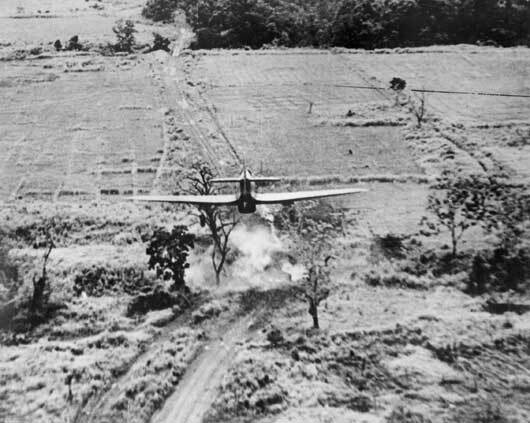 Japanese held strategic targets in Burma were pounded night and day by RAF aircraft (AWM SUK13215B).